Microscope Imaging Station. 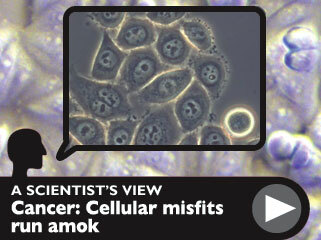 Cancer: Cells behaving badly. How do cancer cells misbehave? Watch and listen as cancer researcher Dr. Thea Tlsty explains how genetic blips turn cancer cells into the rogues they are. It’s quite likely your body is harboring precancerous cells. Don’t panic: this doesn’t mean you have cancer. Many of us have cells here and there with defense mechanisms that don’t work as they should, creating the potential for these cells to grow into cancerous tumors. In the vast majority of cases, though, they haven�t. Why not? Given the surprising frequency of precancerous cells in the body, some cancer researchers have shifted their questioning from “What causes cancer?” to “What keeps these precancerous cells under control?” They hope that by understanding potentially cancerous cells at their earliest stages, they can stop cancer before it starts. The basics: What is cancer? Cancer isn’t just a single condition; it’s actually a complex collection of diseases that can arise in almost any tissue in the body. What characterizes full-blown cancer cells is that they’ve become decidedly anti-social, carrying on their activities without regard to the other cells and tissues around them. Most normal cells are monitored by a myriad of mechanisms that keep them working in cooperation with other cells. When damage prevents them from doing so, they fix themselves or die. Every cancer starts as a disruption of this normal activity. For example, most cells know it’s time to divide when they get signals from nearby cells or other parts of the body. Cancer cells, however, will divide whenever they please, regardless of how much they crowd their neighbors. They’ll also move to places they don’t belong, attract blood vessels to themselves, and stop obeying aging signals. In short, cancer cells misbehave, and their mischief gives rise to tumors. Each cancer has its own unique pattern of bad behavior determined by the tissue in which it was formed, the mutations the cells have adopted, and the chemistry in an individual’s body. Because every cancer is unique, a treatment that works wonders for a leukemia patient, for example, might do little or nothing for a woman with breast cancer. Even patients who have the same kind of cancer will have different responses to the same therapy, because the way the cancer arises and plays out depends on unique cellular events and the patient’s individual genome.